If you followed my Twitter or Facebook status a couple weeks ago, you know this news: Thom and I are engaged. We’ve talked about this amongst ourselves for a while, so it was kind of planned — no one surprised anyone with a ring in the champagne or got down on one knee — but still special and romantic. We plan to have a wedding in the Bay Area sometime this fall. Although we are already registered domestic partners, there is nothing like a ceremony with our friends and family present. We’ll have it regardless of the outcome of the Prop 8 court challenge, and if the ban is overturned, which we hope will be the case, then we’ll get legally married! Our Valentine’s Day weekend was spent on a little road trip down the Central Coast. On Saturday we went to Hearst Castle in San Simeon, about a four-hour drive from here in Daly City. That night we had dinner in Carmel at Citronelle, where we popped the question. (We said yes!) We stayed the night at the Hyatt Regency Monterey and the next day visited the Monterey Bay Aquarium. It was a lovely getaway (though the drive back on Sunday was stormy and harrowing). My photos from Hearst Castle are up on Flickr, and soon I’ll add the aquarium photos to the set. And so the wedding planning begins! My very best to you – congratulations to both of you. 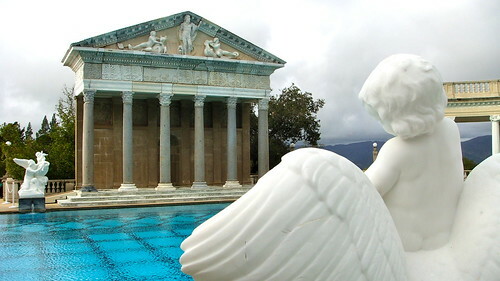 Your photo of the Hearst Castle pool is beautiful.